Last week was our lesson on Mary during our religious education class. We like to use this week to learn a little bit more about the Rosary and how we can pray to Mary. Last year, we used our Walkable Rosary, which was a hit. This year we wanted to create a resource tool that taught them (and hopefully their parents too) how to pray the Rosary. I designed a lapbook that included the prayers, directions and mysteries that they would need in order to pray a complete Rosary. While we know this was pretty advanced for our first graders, we were hoping it would be an introduction to our students and more of a tool for the whole family to use. To save time since we only have an hour and a half each week, I cut and prepped everything ahead of time. To get the file folders ready just open them up so they are flat and then fold each side into the center crease. Then make new creases. Now it should have two flaps that open up and meet in the middle. I had the prayer flip books already prepped for them as well. To assemble these, just print and cut and then put them in order based on height. Then I did two staples at the very top. When the students glue this in, they will just need to glue the back page so that the other prayers can flip open. Once all the supplies were passed out, I had each student grab crayons. To make it simpler, they did not have any choice over which prayer was which color. I had them color the same colors I used on my sample so there would be less confusion. Older students could probably handle more choice. We did all of the coloring first since it is hard to color on freshly glued paper. Once we had all the prayers color coded on the flapbook (they just colored the title and left the rest of the page white), we used those same crayons to start coloring in the rosary picture. We went slow and we went in order. We also had the students number the order that they touch the beads. These numbers are the same ones on their "How to Pray the Rosary" card that gets glued in on the right side. Once we got through the first decade, things got a little easier. They started to see the pattern and knew what was a Hail Mary and what was an Our Father. For prayers that are said on the chain (Glory Be and Fatima), we just had them color on the line/chain in the picture. We made it around the rosary and had them color in the final prayers on the chain portion. Now they had the prayers written out for them, color coded to match the picture of the rosary and numbers to help remind them what order to go in. We briefly explained what the Mysteries of the Rosary flapbook was and that you announce/read a mystery at the beginning of each decade. We also talked about how you pray different mysteries depending on the day of the week and we showed them how we labeled each one so they would know what to do each day. We also showed them the "How to Pray the Rosary" card and how it basically reminds them of all the steps that we just talked about together. Once we were done guiding them through the rosary steps, we let them glue all the pieces down and finish any coloring from the cover that they did not get finished. This is the complete rosary and it is a lot for our first graders. I knew that going into it, but we were initially planning to do this on a day the parents came in to visit so we thought it would be more of a family activity that they could do together and hopefully that is how they are using it at home. Once plans changed we kept the same version, but I also created a simpler version that I will use with my first graders in the future. As you can see, the simpler version does not include the mysteries or the final prayers at the end. It is more focused on the common prayers that our students have been memorizing this year. I also have the Fatima prayer included but did not use it in the sample. If you want to simplify it even more, you could just focus on Hail Mary and Our Father with young ones so they start to see the pattern. The rosary is still blank to color code with the prayers. I've also included a version (not pictured) of the rosary that has labels by each bead of the prayer to help scaffold even further. Both the simplified and the complete version are sold together so you can pick and choose what works for your group. This Rosary Lapbook is available in my TpT store right now! 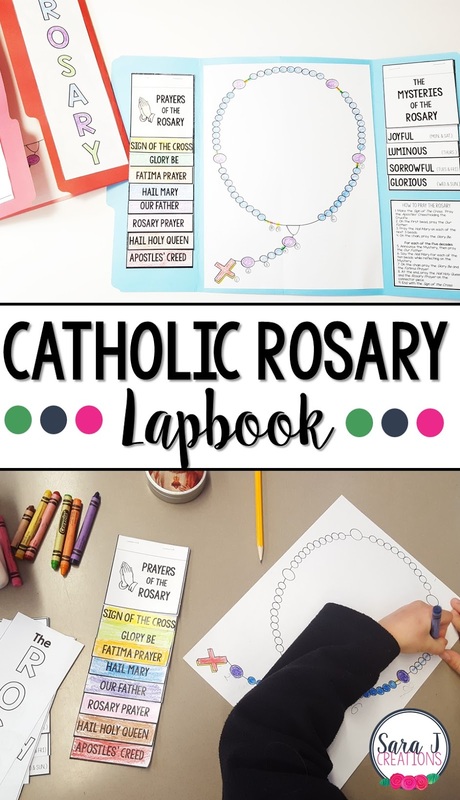 Click here to see more about The Rosary Lapbook. Looking for more lapbook ideas? Check out this blog post about my Catholic Prayers Lapbook to help students learn the prayers of our faith.